Passages marked +++, some substantial, were deleted as merely ad hominem. The few passages which appear to contain what looks as though it were science are reproduced in Roman face. Commentary is in bold face. Comment: The UN’s 2001 report mentions climate sensitivity of 0.5C per watt per square meter. Schmidt’s estimate is higher by half. Lord Monckton’s detailed calculations showed that with climate sensitivity of 0.3C per watt per square meter the entire observed temperature increase since 1900 could be accounted for. Comment: Lord Monckton’s article was explicit that the units for what the UN calls “lambda” are degrees C per watt per square metre. If Schmidt dislikes the use of these units, he should take the matter up with the UN. Comment: No, not 0.27C. If emissivity is unity the climate sensitivity in the climate-relevant temperature range is 0.22C per watt per square meter. This is a matter of elementary calculation. Comment: My article and the supporting calculations took full and explicit account of the fact that Earth/troposphere emissivity is not 1 (for a blackbody) but ~0.6 (the Earth being a badly-behaved greybody). Schmidt had seen the supporting calculations, because he later mentions the “M climate model”, to which my article did not refer by name. Schmidt ought to have known that the Stefan-Boltzmann radiative-transfer equation, often miscalled the “blackbody” equation, is in fact capable of representing not only blackbodies (emissivity 1) that absorb and, by Kirchhoff’s law, emit all radiation, but also whitebodies (emissivity 0) that reflect all radiation, and all graybodies in between. Schmidt here erroneously implies that this fundamental climate equation applies to blackbodies only. A fourth-rate zoologist in the UK lifted this unfortunate implication from Schmidt’s blog without checking it, and repeated it in a UK newspaper, which was obliged to print an article correcting this and other schoolboy errors arising from Schmidt’s blog on the following day. Comment: Climate feedbacks are of course explicitly mentioned in my article. My article, far from ignoring feedbacks, demonstrated that, even if positive and negative feedbacks cancel, the entire 20th-century mean surface air temperature increment can be accounted for. Also, in the accompanying document the official explanation for the discrepancy between observed and projected temperatures – namely, climate feedbacks – is explicitly stated. Schmidt appears to believe that climate feedbacks are what prevent the Earth from being a blackbody. In fact, emissivity and climate feedbacks are independent climate processes each of which must be taken separately into account. Comment: My article was concerned with what real world results would be. Comment: My article was concerned with what real world temperature changes would be. Comment: No. It is not clear that “the best definition of forcing is the change in flux at the tropopause”. Dr. Hugh Elsaesser, in a paper submitted to the IPCC, said there is likely to be a pronounced difference between tropopausal and surface temperature response. Observation has proven him right. The UN’s models only achieve high climate sensitivity because they posit a significantly faster rate of increase in temperature in the high troposphere than at the surface, particularly in the tropics and sub-tropics. However, the observed rate of upper-troposphere increase is far too low to match the UN’s predictions. Professor Richard Lindzen of MIT concludes that the UN’s climate-sensitivity projection is overstated by at least a factor of three, concurring with my own calculations. Comment: The “hindcasts” do not match observations well: as the article pointed out, there is a large shortfall between observed and projected temperatures, which led the Hadley Centre – proprietor of one of the UN’s models – to divide its projections by three. The article also mentioned evidence on both sides of the case for the oceans acting as a heat-sink to account for the shortfall, and it mentioned Stern’s 84% of projected forcing taken up by the oceans. Comment: Here again Scmidt confuses emissivity and climate feedbacks. Precisely to avoid such confusion (understandable among non-scientists), my calculation methodology was identical to that of the models on which the UN relies. I used the UN’s definition of radiative forcing, the UN’s CO2 forcing equation and the UN’s all-ghg-to-CO2 ratio, all of which are explicitly quoted in my calculations, which Schmidt has seen. Comment: My article explicitly mentioned, took into account, and gave evidence for and against, the notion that the ocean was the cause of the difference between the transient and equilibrium climate responses to a given forcing. Comment: Using the UN’s CO2 forcing equation, and its all-ghg-to-CO2 ratio, I calculated the 1900-1998 forcing from all ghgs as 1.99wm-2. Using the Stefan-Boltzmann equation for the Earth/troposphere system as a greybody with dT 0.6C, I calculated the 1900-1998 forcings from all sources as 1.98wm-2. The two values are near-identical, suggesting either the cancellation of positive and negative feedbacks or the ocean notion, or some combination of the two. Either way, there is no cause for climate alarmism on these figures. Comment: Again, I used the UN’s assumptions, which is that non-ghg forcings are not as well understood as ghg forcings, and that – as its table of forcings shows – all non-ghg forcings broadly self-cancel. This point was clearly explained, and illustrated with the UN’s forcings table, in the supporting calculations, which Schmidt had seen. Comment: I cited Hansen et al. 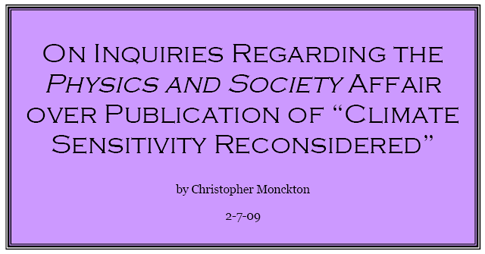 (2006), making a similar point. My article correctly showed that, if one takes 1900 and not 1750 as the start-date for solar forcings, so as to coincide with the 20th-century temperature rise of 0.6C relied upon by the UN, its own table of solar-irradiance proxies shows a base 20th-century solar TSI increment of some 4wm-2, equivalent to about 0.7wm-2 outgoing at the tropopause after allowing for albedo and disc-to-sphere. This is before adding climate feedbacks, for which the UN’s current multiple of base forcing is approximately 2.7 according to Sir John Houghton in a reply to a question from me on the subject. Thus one multiplies the solar forcing by the feedback coefficient to get forcings plus feedbacks – i.e. 1.9wm-2, which is close to the 2wm-2 actually observed. However, the accompanying calculations, which Schmidt has seen, made it very clear that I had assumed, as a base case, no solar forcing above that mentioned by the UN, and that I had compared that case with others, some of which had considered 20th-century solar forcings greater than those assumed by the UN. Comment: My article explicitly addressed the need to apply climate feedbacks to all forcings and said the UN had not done so. See Solanki and Usoskin (2005) for a conclusion that the Sun has been hotter, for longer, in the past 50 years than in the past 11,400 years. Recent papers apparently disputing this have failed to take account of Solanki’s point that it is the combination of the amplitude and duration of the recent solar activity that is exceptional, not the amplitude alone. Passages marked +++, some substantial, were deleted as merely ad hominem. The passages which appear to contain what looks as though it were science are reproduced in Roman face. Commentary is in bold face. Comment: My analysis of the Summary for Policymakers stated, correctly, that the UN’s upper-bound projection of sea-level rise to 2100, which had been 88cm in 2001, had been cut to 43-59cm in 2007, a reduction of between one-third and one-half depending on which scenario one uses. The Sunday Telegraph, the first newspaper to announce this reduction, verified it with the UN before printing it. The UN said the reduction in high-end forecasts on all scenarios had been made because “better data” were available. Quite. Schmidt: “… that the human contribution to recent changes has been 'cut by a third' (no it hasn't), and that the Summary for Policy Makers (SPM) was written by politicians (no it wasn't – the clue is in the name). Comment: The table of forcings in the UN’s 2001 report showed greenhouse-gas forcings summing to 2.43 watts per square meter, with all other forcings broadly canceling each other out. The equivalent table for 2007, albeit rotated by 90 degrees to make visual comparison less easy, reduces the 2001 report’s 2.43-watts-per-square-meter estimate of the anthropogenic greenhouse-gas contribution compared with 1750 by one-eighth to 2.3 watts per square meter despite a statement that radiative forcing from CO2 alone had increased by 20% since 1995. In addition, the report ascribes a large negative forcing to the effect of pollutant aerosol particles in the atmosphere for the first time. Also for the first time, taking into account negative as well as positive forcings, the UN states its estimate of total forcings, rather than allowing them to be deduced from the table of forcings. Its stated estimate of the anthropogenic forcing is 1.6 watts per square meter, down by a third from the previous report’s 2.43 watts per square meter. Comment: My analysis correctly stated that the UN, in its present report, had failed to apologize for the universally-discredited “hockey-stick” graph, and that its failure to apologize undermined its credibility and scientific integrity. I did not say that the “hockey-stick” had been dropped. I wish it had: then one could perhaps start to have some confidence in the IPCC process. Schmidt: “Thus on any index of wrongness, this WSJ editorial scores pretty high. What puzzles us is why their readership, who presumably want to know about issues that might effect their bottom line, tolerate this rather feeble denialism. While we enjoy pointing out their obvious absurdities, their readers would probably be better off if the WSJ accepted Jeffery Sachs' challenge. For if they can't be trusted to get even the basic checkable facts right on this issue, why should any of their opinions be taken seriously? style=”text-align: justify”>They gave one technique for reconstructing pre-thermometer temperature 390 times more weight than any other (but did not say so). style=”text-align: justify”>The technique they overweighted was one which the UN’s 1996 report had said was unsafe: measurement of tree-rings from bristlecone pines. Tree-rings are wider in warmer years, but pine-rings are also wider when there’s more carbon dioxide in the air: it is plant food. This carbon dioxide fertilization distorts the calculations. style=”text-align: justify”>They said they had included 24 datasets going back to 1400. Without saying so, they left out the set showing the mediaeval warm period, tucking it into a folder marked “CENSORED_DATA”. style=”text-align: justify”>They used a computer model to draw the graph from the data, but scientists later found that the model almost always drew hockey-sticks even if they fed in random, electronic “red noise”. > The large, full-colour “hockey-stick” was the key graph in the UN’s 2001 report, and the only one to appear six times. The Canadian Government copied it to every household. Four years passed before a leading scientific journal would publish the truth about the naff graph. Did Kofi or Ottawa apologize? Did they heck. The UN still uses the graph in its publications. > After the UN’s graph was exposed, several scientific papers apparently confirming its abolition of the mediaeval warm period appeared. The US Congress asked independent statisticians to investigate. They found that the graph was unmeritorious, and that known associates of the scientists who’d compiled it had written many of the later papers supporting its conclusion. Bjorck et al. (2006) inferred general climatic conditions from "sedimentology, geochemistry, diatom analyses, magnetic properties, and multivariate statistics, together with 14C and 210Pb dating techniques" applied to a core obtained from the center of a small crater lake on the Azores island of Pico (38°26'N, 28°12'W). The mediaeval warm period was broadly characterized by the adjoining "cooler/drier periods" of 400-800 and 1300-1800 cal yr BP, but the authors found it most strongly expressed between AD 1000 and 1100. Chu et al. (2002) derived a climatic history from the geochemistry of dated sediments taken from Lake Huguangyan (21°9'N, 110°17'E) on the Leizhou Peninsula of South China, as well as from information contained in historical documents. The Mediaeval Warm Period occurred between AD 900 and 1300. Gupta et al. (2005) derived a high-resolution record of variations in the Indian summer monsoon from relative abundances of the planktic foraminifer Globigerina bulloides which they had obtained from a sediment core off the coast of Oman in the northwestern Arabian Sea (18°03.08'N, 57°36.56'E), indicating that southwest monsoon winds were stronger during the Mediaeval Warm Period (AD 800-1300), coincident with a period of high solar activity. Hallett et al. (2003) compared the dendrochronological fire history of the forested area surrounding Dog Lake (50.77°N, 116.1°W) with a high-resolution charcoal record derived from a sediment core extracted from the lake to reconstruct the region's fire history over the past 1000 years. In addition, the authors constructed a proxy record of lake-level change based on accumulation rates of Chara globularis-type oospores in the lake sediment core. These analyses revealed the presence of frequent forest fires and lowered lake levels during the Mediaeval Warm Period (AD 980-1270), which in the words of the authors support evidence of "warmer and drier climate than today." Holzhauser et al. (2005) present a high-resolution record of glacial variation for Gorner glacier, in the Swiss Alps (~46.05°N, 7.62°E), as part of an effort to develop a 3500-year climate history of west-central Europe. In their estimation, "at no other glacier in the Swiss Alps … [is] the Mediaeval Climatic Optimum so well documented as at the Gorner glacier," especially when the glacier retreated to levels beyond that of the present-day between AD 800 and 1100. Because glaciers in mountain areas are "highly sensitive to climate changes and thus provide one of nature's clearest signals of warming or cooling and/or dry and wet climate periods," as they describe it, "one can say that the quasi periodical fluctuations of Alpine glaciers were driven by glacier-hostile (warm/dry) and glacier-friendly (cool/wet) periods." On this basis, therefore, one can cautiously conclude that temperatures at Gorner Glacier were likely warmer during the Mediaeval Warm Period than they have been recently. Holzhauser et al. (2005) also present a high-resolution record of glacial variation for the Great Aletsch glacier in Swiss Alps (~46.38°N, 7.75°E), as part of an effort to develop a 3500-year climate history of west-central Europe. As they describe it, the Mediaeval Warm Period occurred between AD 800 and 1300; and based on data presented in their Figure 2 (reproduced below), glacial extension between AD 800 and 1000 was at a level equal to that of today. Furthermore, because glaciers in mountain areas are "highly sensitive to climate changes and thus provide one of nature's clearest signals of warming or cooling and/or dry and wet climate periods," in their estimation, they state that "one can say that the quasi periodical fluctuations of Alpine glaciers were driven by glacier-hostile (warm/dry) and glacier-friendly (cool/wet) periods." On this basis one can logically, albeit cautiously, conclude that temperatures during the Mediaeval Warm Period were likely as warm as they are today at the Great Aletsch Glacier. Holzhauser et al. (2005) also present a record of glacial variation for the Lower Grindelwald glacier, in the Bernese Alps, Switzerland (~46.58°N, 8.00°E), as part of an effort to develop a 3500-year climate history of west-central Europe. The Mediaeval Warm Period was identified in their Figure 2 as a period of significant glacial recession between AD 800 and 1300. Khim et al. (2002) inferred general climatic features from a study of the grain size, total organic carbon content, biogenic silica content and, most importantly, magnetic susceptibility of 210Pb- and 14C-dated sediments retrieved from the eastern Bransfield Basin (61°58.9'S, 55°57.4'W) just off the northern tip of the Antarctic Peninsula. Most of the Mediaeval Warm Period (AD 1050-1550) was warmer than the Current Warm Period. Kitagawa and Matsumoto (1995) analyzed δ13C variations of Japanese cedars growing on Yakushima Island, southern Japan (30°20'N, 130°30'E), in an effort to reconstruct a high-resolution proxy temperature record over the past two thousand years. The Mediaeval Warm Period occurred between AD 800-1250 and from the authors' Figure 3, peak warmth during this time was about 1°C above that of the Current Warm Period. > Mangini et al. (2005) developed a highly-resolved 2000-year record of temperature with better than decadal resolution from a stalagmite recovered from Spannagel Cave in the Central Alps of Austria (47.09°N, 11.67°E). The highest temperatures of the past two millennia occurred during the Mediaeval Warm Period (AD 800-1300) and were “slightly higher than those of the top section of the stalagmite (1950) and higher than the present-day temperature.” In fact, at three different points during the mediaeval warm period, their data indicate temperature spikes in excess of 1°C above present (1995-1998) temperatures of 1.8°C. Noon et al. (2003) inferred primarily summer climatic conditions from a δ18O record preserved in authigenic carbonate retrieved from sediments of Sombre Lake (60°43'S, 45°38'W) on Signy Island, maritime Antarctica. The Mediaeval Warm Period (AD 1130-1215) was warmer than the Current Warm Period. Pla and Catalan (2005) analyzed chrysophyte cyst data collected from a sediment core obtained from Lake Redon (42.64°N, 0.77°E) in the Central and Eastern Pyrenees of northeast Spain, producing a history of winter/spring temperatures for this region throughout the Holocene. The mediaeval warm period (~ AD 875 to 1000) was categorized as the "warmest period" of the record, with temperature about 0.25°C warmer than it is currently. Qiang et al. (2005) conducted stable carbon isotope analyses on sediment cores taken from Lake Sugan (38°51.19'N, 93°54.09'E), in the northeastern region of the Tibetan Plateau, to produce a proxy of winter temperatures over the past 2,000 years. The results indicated a warm and dry period between 580 and 1200 AD, which they state "corresponds to the Mediaeval Warm Period." A view of the data in the author's Figure 3 reveals the mediaeval warm period was probably at least as warm between ~AD 1100 and 1200 as it is presently . Rein et al. (2005) derived sea surface temperatures from alkenones extracted from a high-resolution marine sediment core retrieved off the coast of Peru (12.05°S, 77.66°W), spanning the past 20,000 years and ending in the 1960s. From their Figure 11, adapted below, it can be seen that the warmest temperatures of this 20,000 year period (~23.2°C) occurred during the late Mediaeval time (AD 800-1250). Taking this value, 23.2°C, and comparing it with the modern monthly long-term means in sea surface temperature, which the authors characterize as between 15°C and 22°C, we estimate the peak warmth of the Mediaeval Warm Period for this region was about 1.2°C above that of the Current Warm Period. Seppa and Birks (2002) reconstructed July mean temperatures from a pollen profile of the sediments of Toskaljavri (69°12'N, 21°28'E), a tree-line lake in the continental sector of northern Fennoscandia. The mediaeval warm period occurred between AD 600 and 1000 and was 0.8°C warmer than today. Tyson et al. (2000) reported that maximum annual air temperatures in the vicinity of Cold Air Cave (24°1'S, 29°11'E) in the Makapansgat Valley of South Africa were inferred from a relationship between color variations in banded growth-layer laminations of a well-dated stalagmite and the air temperature of a surrounding 49-station climatological network developed over the period 1981-1995, as well as from a quasi-decadal-resolution record of oxygen and carbon stable isotopes. The mediaeval warm period (AD 1000-1325) was as much as 3-4°C warmer than the Current Warm Period (AD 1961-1990 mean). Williams et al. (2005) inferred temperatures from δ18O data obtained from four stalagmites found in caves at Waitomo (38.3°S, 175.1°E) on New Zealand's North Island for which 19 TIMS uranium series ages were measured. The Mediaeval Warm Period occurred between AD 1100 and 1400 and was warmer than the Current Warm Period. Wilson et al. (1979) derived temperatures from an 18O/16O profile through a stalagmite found in a New Zealand cave (40.67°S, 172.43°E), revealing the mediaeval warm period to have occurred between AD 1050 and 1400 and to have been 0.75°C warmer than the current warm period. align=”center”> *Views here expressed are those of the author, and not necessarily those of SPPI.